SpecConnect Pro Subscription - Cellular EU, for use with cellular modems. With this online software you can see your data and more on your computer or smartphone. 1 year subscription for EU customers only. Contact us for subscriptions outside the EU. Create custom alerts that can be send to up to 4 different phone numbers for text messages and 4 email addresses (additional subscription is required for the Alert Module). View Alert summaries right on the dashboard. See all of your station locations along with the current conditions. When hovering over a station with the mouse you get expanded details from that particular station. Use the Map View to see if there are problems and if some stations are in the alert state. 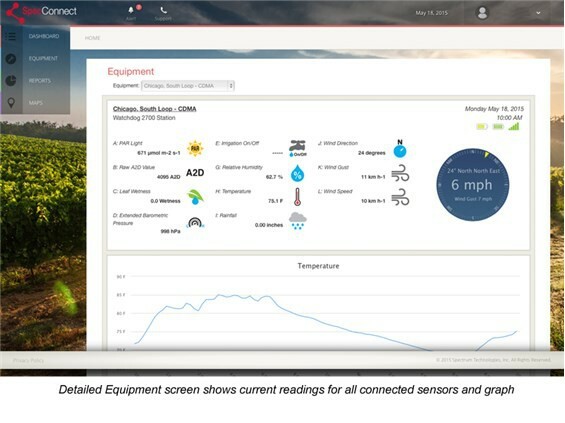 See real-time weather information, including current readings for all external sensors, and monitor data in column format or line graph. Free fully-functional mobile APP for your smart phone and tablet - iOS and Android versions. Use the Mobile APP to view data, or to configure stations, sensors, alerts and create basic reports.